Habit: Tillandsia flexuosa grows without discernible stems. The leaves are covered with pale lepidote scales that form transverse lines across the loose pseudobulb that is open forming a water holding center. The leaves are to 50 cm in length, without a distinction from leaf base to leaf, with an acuminate leaf apex and entire margin and are whorled forming a twisted shaped pseudobulb. The actinomorphic flowers are arranged in a loose, open, panicle of spikes to 40 cm in length, each subtended by a bract. The greenish bracts are linear to ovate with an acute or apiculate apex and are equal to or shorter than the length of the calyx. There are 3 green unfused sepals in the calyx. There are 3 white to pink petals in the corolla. There are 6 stamens that are longer than the petals. The ovary is superior with 3 locules and numerous seeds. The stamens are exerted from the flower. The fruit is a capsule. Each seed has a tuft of hair to assist in dispersal. T. flexuosa grows in clumps or 2 - 4 pseudobulbs. 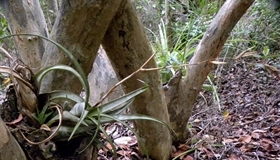 Habitat: Tillandsia flexuosa grow on shrubs and trees in wetlands and Dry Broadleaf Evergreen Formation – Forests and Shrublands (coppice and scrublands). Distribution in Bahamas/Globally: Tillandsia flexuosa occurs on all island groups within the Bahamian Archipelago, Florida, the entire Caribbean region, and Panama south to northern South America. Medicinal/Cultural/Economic usage: Tillandsia flexuosa has no known medicinal use in the Bahamas.